April Guest Speaker, Desiree Brooks, Program Specialist- Mortgage Crisis Job Training at The WorkPlace. The Connecticut housing market is still recovering from the Great Recession. For homeowners struggling to make their mortgage payments, who may be behind as a result of available/sustainable employment; the state has provided funds to The WorkPlace to operate the Mortgage Crisis Job Training Program. 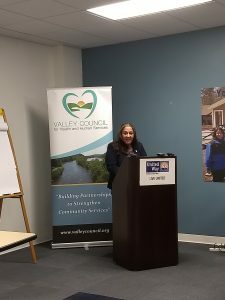 Each year, the program provides hundreds of homeowners with no cost education and training, financial counseling, customized employment services, and referrals to additional supportive services. It is their hope that the program continue to be funded and assist CT families at risk of foreclosure.